Hi there! 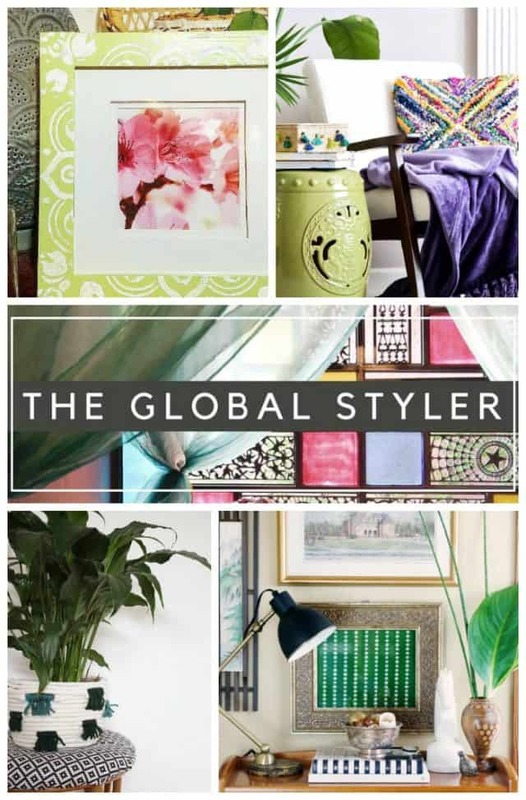 Welcome to our second The Global Styler series hosted by Casa Watkins Living. If this is your first time here, I’m so happy to have you. You will find a lot of posts with rental friendly decorating tips in an eclectic style. This month we’ve added a new creative team member, Jessica from House Homemade, to share global inspired projects with us. Since St Patrick’s Day is coming up we thought it would be fun to incorporate green into this month’s DIY. I just shared our Wes Anderson dining room makeover but there was one little corner that was neglected. Here’s the view from our living area of the decorated space. We needed a cabinet to hold our electrical components for the tv around the corner and found this one at the local thrift store. I quickly updated it with some pulls I had on hand. A big renter frustration is not being able to change wall colors in this house. I’ve learned with experience that I just have to embrace where we live and not fight the elements I don’t like. To do this, I tend to find inspiration from unlikely resources and study styles that fit our taste. For this particular space, the rattan doors with the tatami floors and wood architectural details in the room made me think of British colonial style. I would still prefer white walls to play off bold pops of green and eclectic decor but white tribal patterned sheer panels over the shoji screens help lighten the room and hide the few holes we’ve already managed to accidentally poke in the paper. The walls are actually made with sand. You can see them up close in this picture! The Japanese have a very cool hand towel called Tenugui that is used for wrapping gifts, as a handkerchief, and even attached with a handle for a handbag. I found this green print with polka dots on Miyajima (a popular nearby island) this weekend and framed it as art. Here’s a few shots of the island. It’s famous for it’s “floating” tori gate and the views are breathtaking! The other art pieces in the vignette are a Japanese watercolor scene we recently picked up in Hiroshima and an old print of the governor’s mansion in Colonial Williamsburg. The Wes Elm inspired desk lamp adds a fun triangle shape against all the rectangles. I enjoy displaying items that I actually use like this silver bowl full of vintage napkin rings (from Taipei, Africa, and USA). The rest of my table linens are stored in the Chinese eterege in the room. Here’s a little peek into the living room next to the dining room. There are botanical prints and plants throughout so the main living floor so the rooms feel cohesive. The neat thing about tatami rooms are removable doors so you can configure the space in different ways! It’s really easy to create a British Colonial inspired vignette with neutral colors, plants, rattan, light fabrics, and eclectic global accessories especially from Asia, Africa, India, and the Caribbean with a mix of elegant British accents. Please enjoy the other projects this month! Thanks! So glad you joined our series. Wow Kathy! It’s so gorgeous! You are a master styler, I do swear. I love every vignette you put together. I’m in awe over the “floating” tori gate. And the Tenugui is the prettiest color and design. You are so sweet Corinna! Thank you for the lovely comment. Oh so pretty and so creative. Love it all. British colonial style is right up my alley. I love the use of natural finishes and plants to create an island vacation like feel. This vignette is stunning Kathy and I love love the green art. Beautiful!! Oh my freak, this is beautiful. I need that Tenugui handkerchief asap. It is so pretty and looks perfect framed. That green looks stunning against the cabinetry. So good! This is such a pretty vignette Kathy! That frame Tenugui is so striking, it totally pulled me in! I’m so happy to hear it!! I’ve been struggling with the room but it’s growing on me! Wow, I really love this transformation Kathy! I would’ve never been able to create that. I also actually want to buy a snake plant just like yours for its air-cleaning benefits. Love it! Thank you Leslie!! Love those snake plants!